"Rosemary, Bob and Martin Sincere condolences to you and..."
"Dear Rosemary,Greg & families, My sincere condolences for..."
With heartfelt sadness, we announce the passing of our mother Inez May Matthews at St. Charles Manor in Victoria after a long battle with dementia. She was born in St. Joseph's Hospital, Comox, BC. Inez was predeceased by her loving husband Bert of 68 years, her sisters Alma Preston and Beulah (Bill) Stewart and her brothers Thomas and Chandler (Ivy). She is survived by daughter Rose (Greg) Tull; sons Bob and Martin (Susan) Matthews; grandchildren Russell (Nicole) Tull, Leanne (Jack) Tadman, Tim (Yuka) Pryde, Casey and Matthew Pryde and great-grandchildren, Reid, Katelyn, Madelyn, Earl, Cassidy, Tyler, Dylan and Myles. As the youngest in her family, her earliest years were spent exploring the world from a float camp in Kingcome Inlet. Her father, Thomas, ran a logging camp for the Powell River Pulp and Paper Company. The family attended potlatches and her father played baseball with the natives. Both of her brothers were loggers as young adults and worked with their father from the Queen Charlottes to the Comox Valley. After graduating Grade 13 (Senior Matriculation) from Courtenay High School, she moved to Vancouver to pursue a career as a Coloratura Soprano, singing on the CBC Radio Concert Hall. She trained under the watchful ear of Mrs. Paul her singing coach and simultaneously supported the war effort by working for Boeing Aircraft Canada at Sea Island, Vancouver as a secret documents clerk. Bert and Inez were married in St. Giles Church in Vancouver on January 2nd 1946 and lived at Little Mountain Camp at UBC while Bert attended UBC to study law. In 1950 Inez and Bert moved to Powell River where Bert articled as a lawyer and they started to raise a family. They moved to North Vancouver from Powell River before finally settling in Victoria in 1954. Inez had an amazing voice! She sang in church and community choirs. She sang both classical and contemporary music. A true child of the depression, she grew a large vegetable garden. Inez worked hard at everything, including perfecting her game of golf, receiving a Hole-in-One and Uplands Ladies Club Champion trophies. 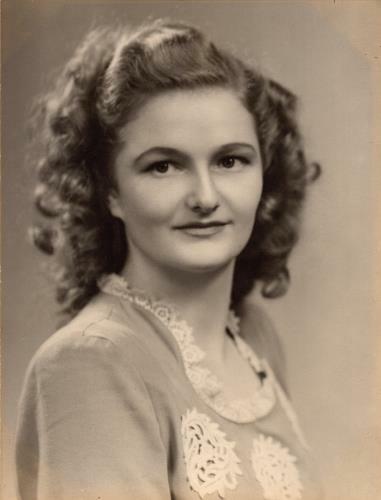 Mom also loved to read, baked huge batches of bread, enjoyed traveling with Bert, and spending the winter in Chandler, Arizona. Our Mother was a devout Anglican and attended services at St. Michael and All Angels' Church. She especially loved and appreciated the guidance of her pastor, the Venerable Dr. Dawna Wall. The family sincerely thanks all of the staff at St. Charles Manor, where Mom lived out her last three months and are especially grateful to Dr. Eric Shafonsky, Dr. Henry Grimwood, and Dr. Darren Cotterell. Remembrance and Celebration of Life Service will be held at St. Michael and All Angels' Church (stmikevictoria.ca), 4733 West Saanich Rd., Victoria, BC at 2:00 pm on Wednesday, April 17th, 2019. A tea will follow the service in the church hall. In lieu of flowers, memorial donations may be made to the Alzheimer Society of BC.